Eleanore Smith of Valencia, California found these photos of the aftermath of the St. Francis Dam disaster in a photo album passed down to her by her aunt Genevieve Smith. Genevieve Smith had moved to East Los Angeles from Chicago sometime between 1915 and 1920. She traveled up to San Francisquito Canyon with her friend Lucy to view the damage from the flood. Lucy took these photos on April 8, 1928. VIEW 1: Caption states "Harry Carey's Ranch. Depth of water shown by stripping of leaves from lower branch. One limb is broken off. Mrs. Clingan and Mary standing below." VIEW 2: Caption states "All that is left of an automobile at Harry Carey's Ranch. Mary is holding hub showing where spokes were broken off." 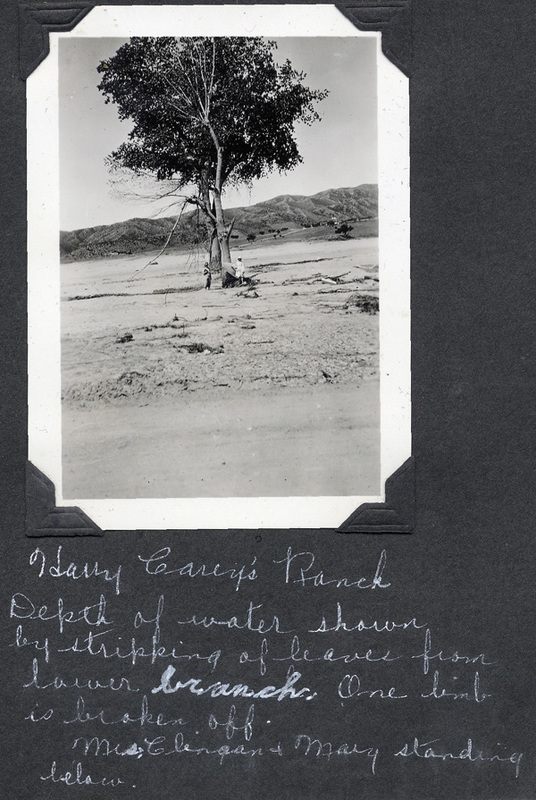 VIEW 3: Caption states "Mary standing beside water tap at Harry Carey's Ranch. Notice depth of hole around roots of tree." VIEW 4: Caption states "Castaic Junction -- Willow trees ironed down by water. Just beyond State Highway Bridge." VIEW 5: Caption states "Newhall Ranch. Bank as deep here as it is high on other side of road." VIEW 6: Caption states "26 machines out of 35 that belonged to Edison men who were in construction camp near Piru. The other 9 machines have been claimed by the families." VIEW 7: Caption states "House washed away from foundation in Fillmore." VIEW 8: Caption states "Wreckage at Fillmore." VIEW 9: Caption states "House with sand piled high across the river from Fillmore toward Bardsdale." VIEW 10: Caption states "Wreckage on bank above machine shows depth of water." VIEW 11: Caption states "Taken from same point of view as #1 [VIEW 10], showing view across the river from this point." Construction on the 600-foot-long, 185-foot-high St. Francis Dam started in August 1924. With a 12.5 billion-gallon capacity, the reservoir began to fill with water on March 1, 1926. It was completed two months later. At 11:57:30 p.m. on March 12, 1928, the dam failed, sending a 180-foot-high wall of water crashing down San Francisquito Canyon. An estimated 470 people lay dead by the time the floodwaters reached the Pacific Ocean south of Ventura 5 1/2 hours later. It was the second-worst disaster in California history, after the great San Francisco earthquake and fire of 1906, in terms of lives lost.